Biloxi Shuckers manager Mike Guerrero has been named the 2018 Southern League Manager of the Year, the league announced on Wednesday. Guerrero has led the Shuckers to a Southern League-best 78 wins with five games remaining in the regular season. In his third season at the helm for the Shuckers, Guerrero has overseen a Shuckers squad that has tied the franchise record for wins in a season, and has a chance to eclipse that mark with five games left on the schedule. Under his guidance, Biloxi went 41-29 in the first half of the Southern League campaign, securing the first half South Division title and locking up Biloxi's second ever trip to the postseason. The Shuckers have also compiled 44 wins at home, the most in the Southern League this season. "Mike and the whole Shuckers staff have done an exceptional job of teaching and working with that talented group of players," said Brewers Farm Director Tom Flanagan. "It's great to see the strides that the players have made throughout the season, and for Mike and his staff to be recognized with this honor." 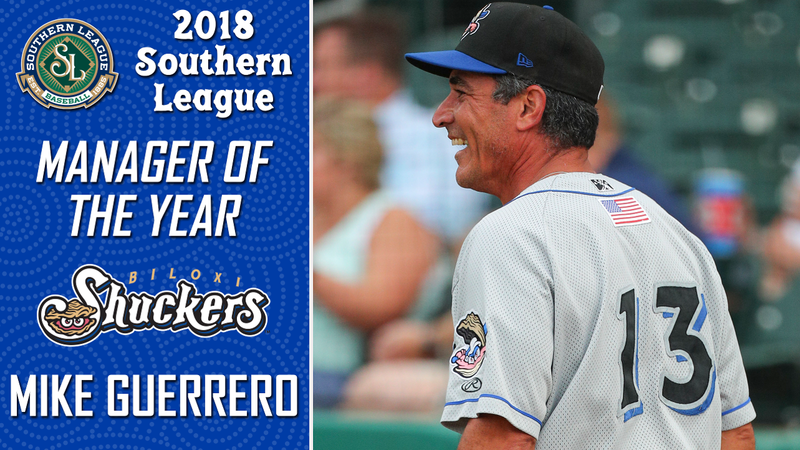 Guerrero has also known how to draw the best out his players all season long, managing the Shuckers to 44 come-from-behind victories, including 15 victories where the Shuckers scored the go-ahead run in the eighth inning, and eight walk-off finishes. His team has also recorded the lowest ERA (3.51) in the Southern League while the Shuckers' offense has slugged the most home runs (142) in the circuit. Overall, Guerrero has compiled a 221-190 record with the Shuckers, leading the team to a winning record in all three seasons in charge. In his 21 seasons as a manager across all levels of baseball, Mike has collected 1,174 wins, including his 1,000th victory while managing the Shuckers on July 14, 2016. He worked as the first base and infield coach for the Milwaukee Brewers in 2014 and 2015 and previously managed in the Southern League with the Huntsville Stars in 2010 and 2011. Mike becomes the second Shuckers manager to win Manager of the Year in the Southern League, joining Carlos Subero, who won the award in the team's inaugural year in 2015. The Shuckers are home for the final five games of the regular season beginning on Thursday night at 6:35 PM. The Shuckers then stay in Biloxi for Games One and Two of their South Division Championship Series matchup next Wednesday and Thursday nights at 6:35 PM CT at MGM Park. Single game tickets for the Biloxi Shuckers 2018 season can be purchased at the MGM Park box office or over the phone through Ticketmaster at (800) 745-3000. Playoff tickets and group outings are also available and can be reserved by calling 228-233-3465 or visiting www.biloxishuckers.com.